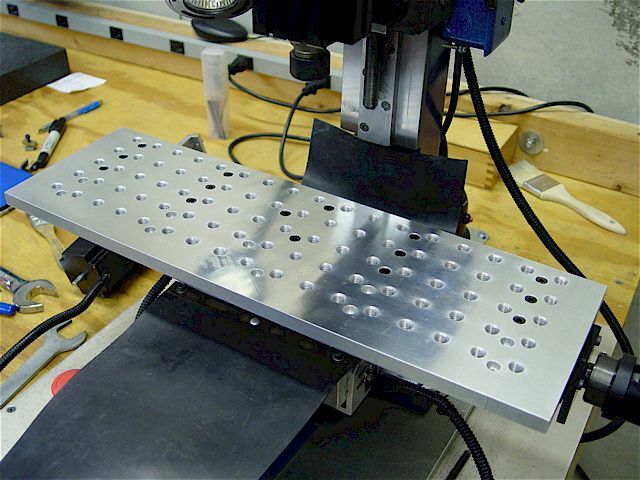 Fabricated a tooling fixture using ALCOA MIC6 machined cast aluminum plate for use on the Taig CNC micro mill. 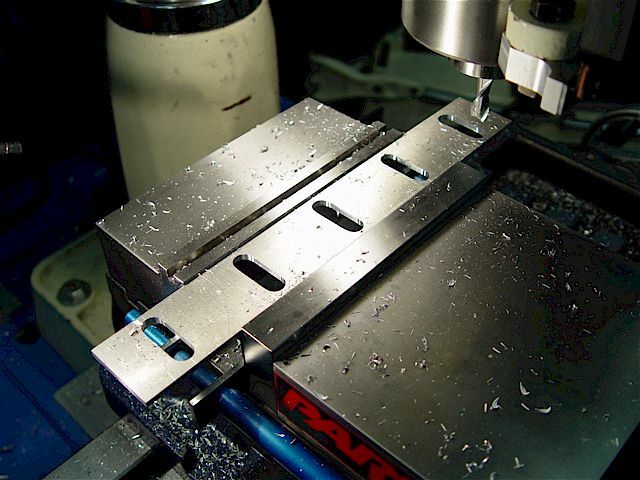 1/2" x 5-1/4" x 18-1/2" precision machined cast aluminum alloy plate (plastic cover still attached). Scribing lines using Steel Blue Dykem layout fluid to increase contrast. 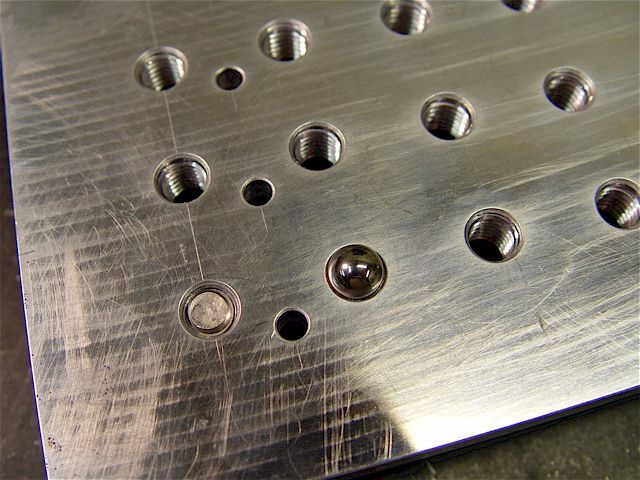 The plate has a 1" on centers pattern of 3/8-16 threaded holes allowing use of various toe-clamp sets. CAUTION: Dykem liquid deeply stains fingers, clothing, & surfaces. Hard to remove. 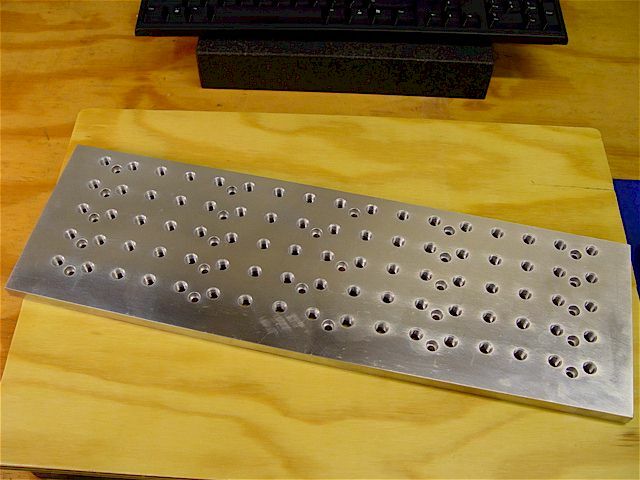 Used the floor drill press to make 5/16" pilot holes (75% thread) for the 3/8-16 tap. 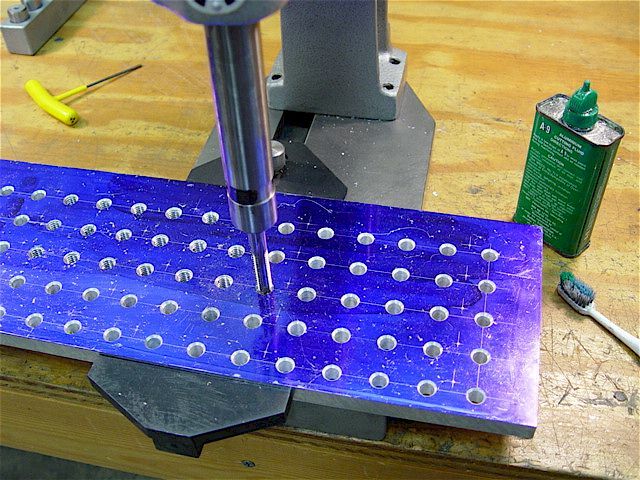 Also see: How to Drill a Hole, "Introduction to Taps" pages one & two plus the Tapping Tables. 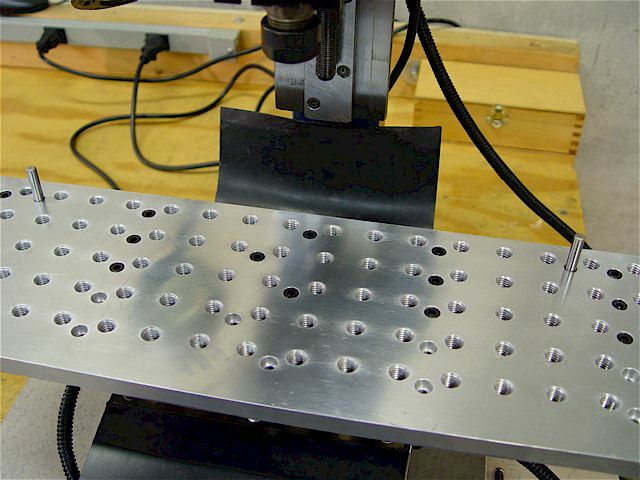 Used the hand-tapping fixture to thread 87 holes. 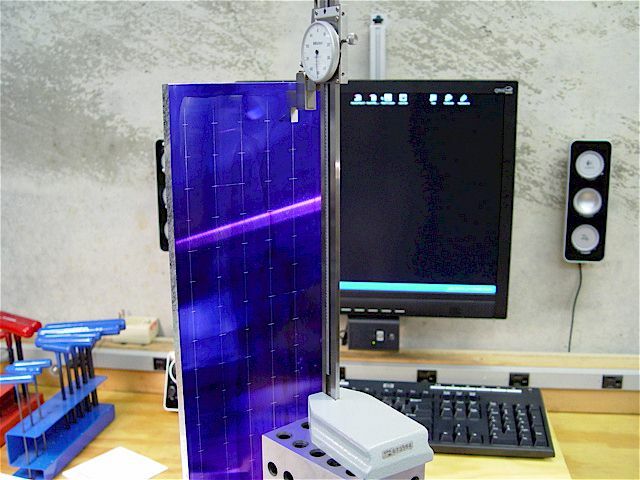 Aluminum tapping fluid is recommended. 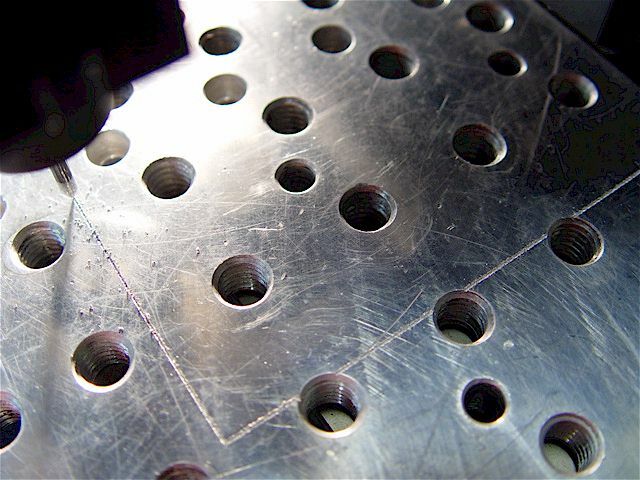 Both sides of all the holes were countersunk before tapping to reduce burs from threading. A plug-type tap was used as it pushed the burs forward & out the through hole. 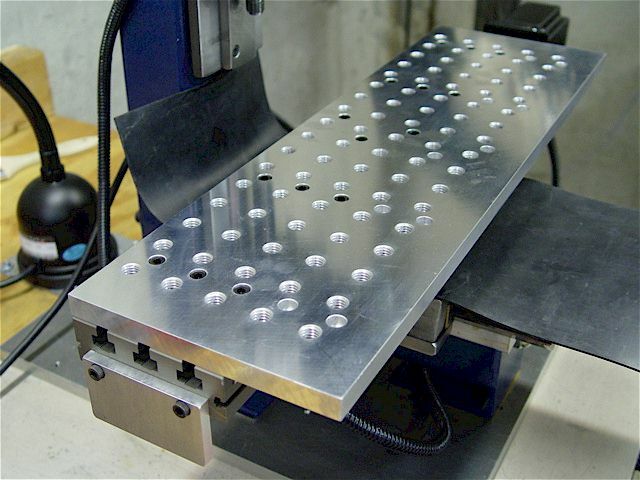 room for toe clamps thus the entire 4" x 12" machining range is available. 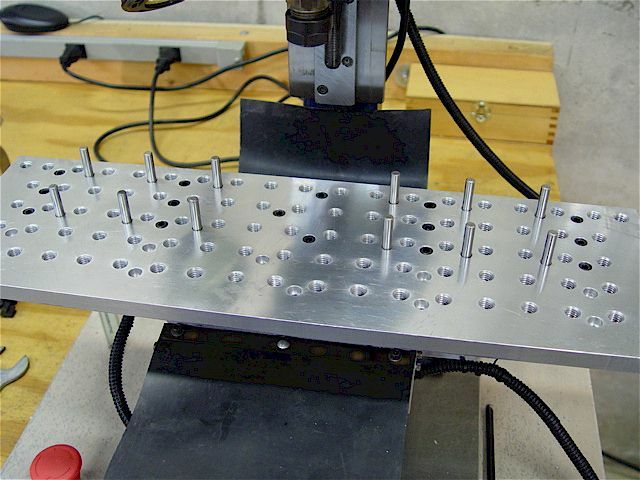 Twenty, counter-bored holes for 10-32 cap-head bolts & T-nuts are available to attach the tooling plate to the table. 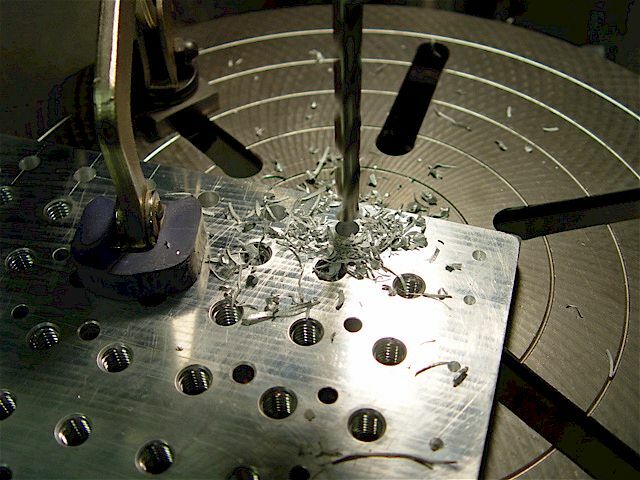 Their pattern allows the plate to be placed at different locations on the 3-1/2" x 18-1/2 " Taig mill table. 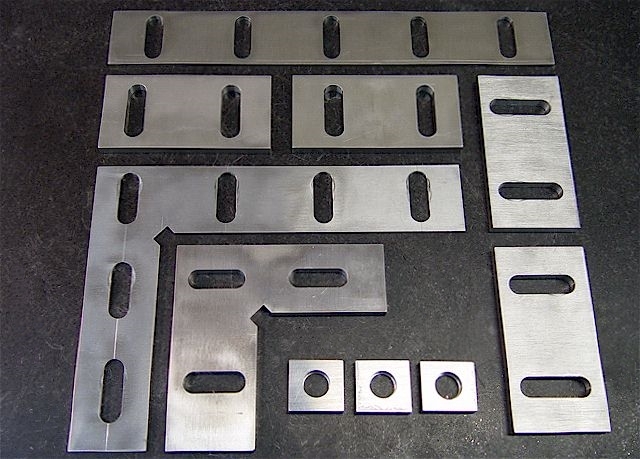 Tooling plate dimensions. Taig Mill table cross-section dimensions. Note the center 10-32 tie-down bolts are staggered. to the mill's table while also stopping/holding the screw when tightening down the toe clamps. A chisel could also have been used to the same effect but it can raise a burr that would have to be removed. 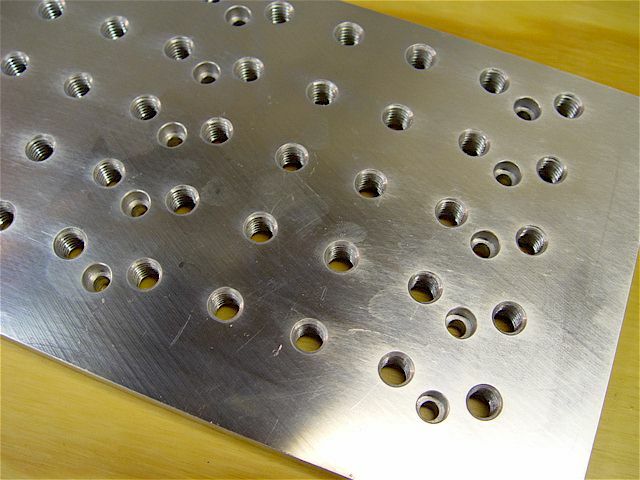 Twelve, precision reamed slip-fit 0.2510" holes were made for 1/4" alignment dowel pins. 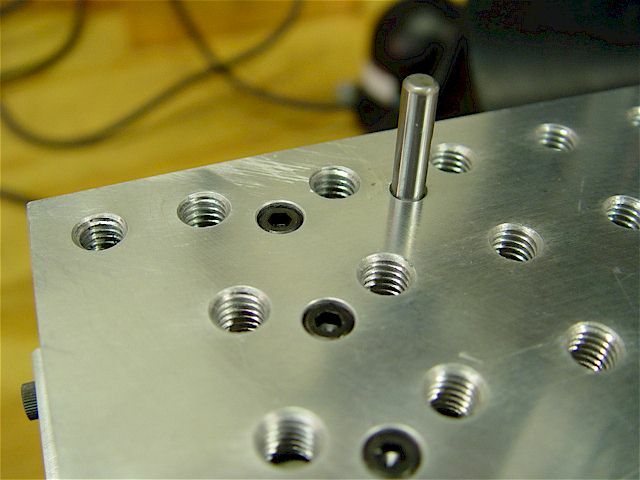 The Taig table T-slots are 1/4". 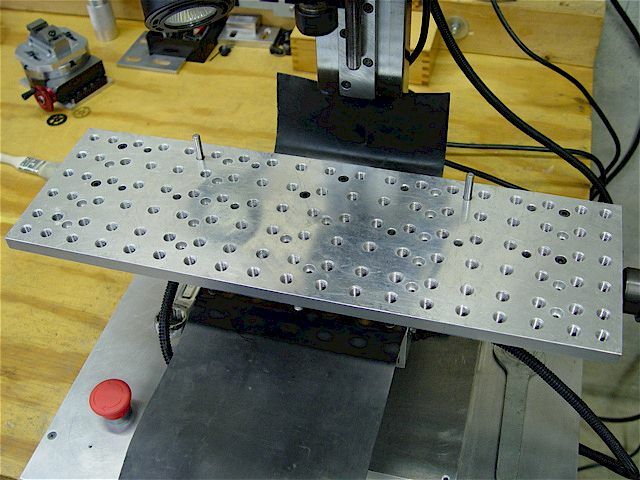 The pins allow quick, repeatable plate to table setup. 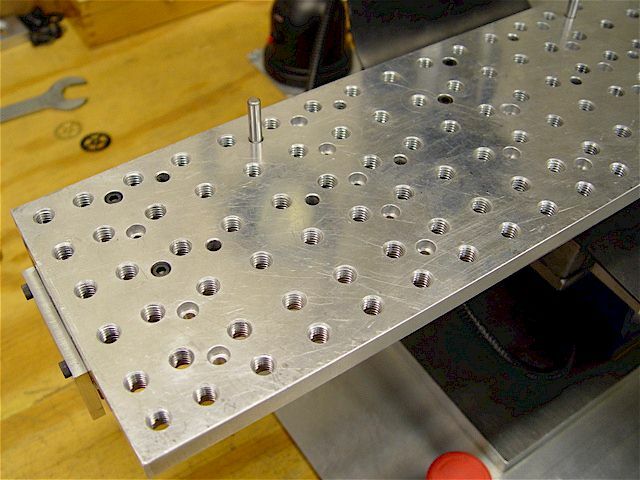 Added more 1/4" reamed holes for alignment dowel pins to help set up subassemblies. Added more tapped holes along the left, bottom, & right edges for a new total of 114 locations. Engraved lines on the plate that represent the XY limits of the mill's bed. Removed the burrs & filled-in with black marker. The extra clamping areas are clearly seen. Made an acrylic table cover to enable paper & ink path tracing of CAD-CAM parts. More tapped holes for the plate. 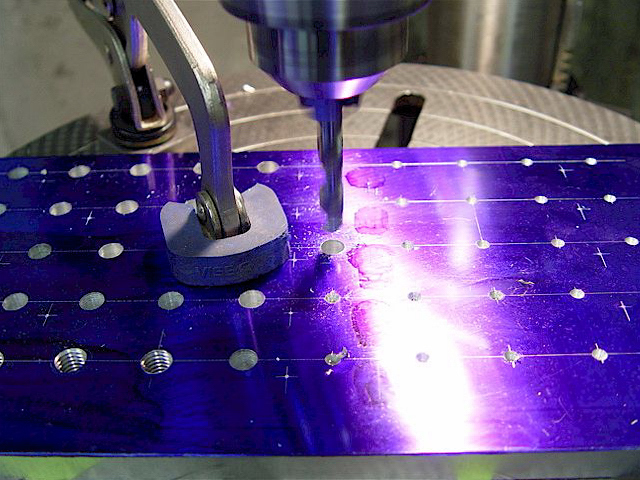 Milling 3/8" adjustment slots in an edge fixture for the tooling plate. 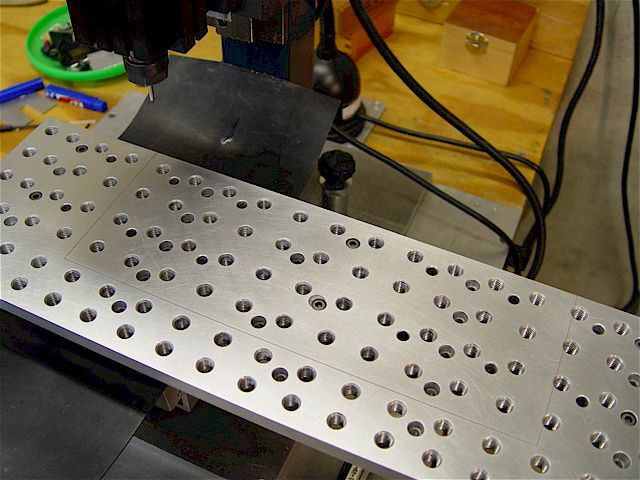 1/4" & 3/32" thick tooling fixtures for 3/8" bolts on 1" hole pattern. Mitee-Bite low-profile edge clamp specs (USA). 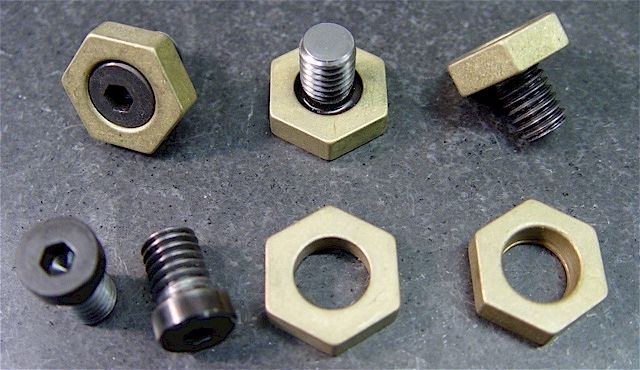 The hardened bolt cam head pushes the hex nut against the part. 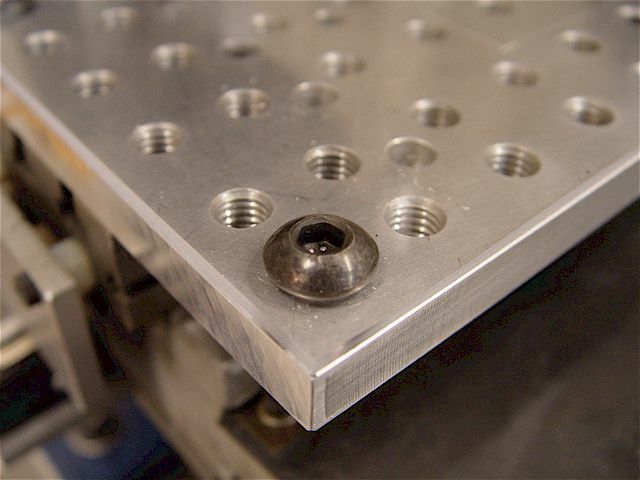 The bolts were shortened from 0.71" to about 0.51" so they would not protrude through the tooling plate. 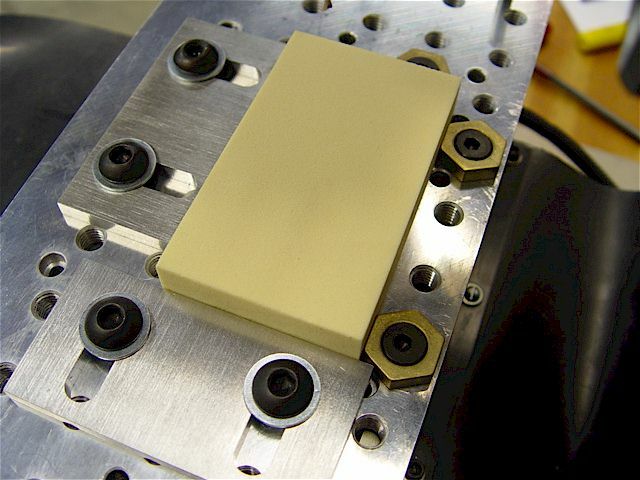 The Mitee-Bite clamp hole geometry was reproduced for these low-profile, aluminum edge clamps. 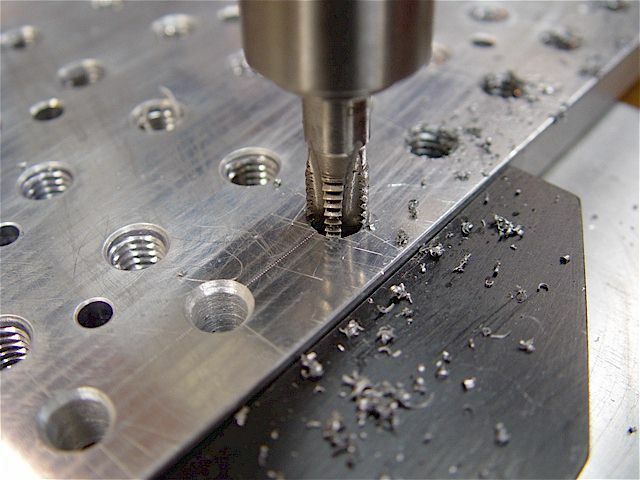 Simply a 15/32" clearance hole followed by a 1/2" end mill to a depth that leaves a small lip at the bottom. 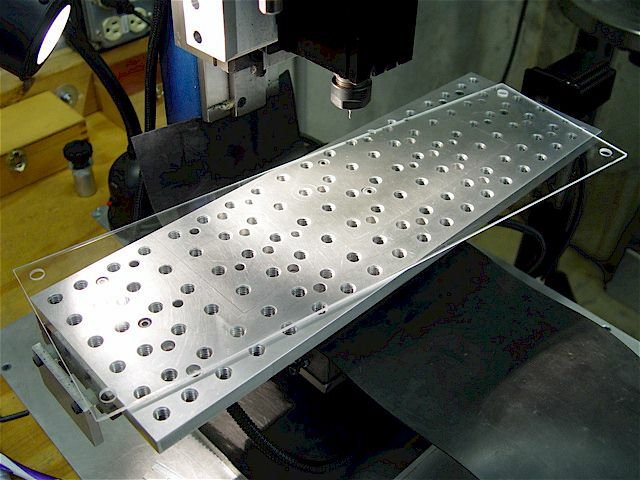 Low-profile tooling plate edge holding fixtures. Used a Starrett 3/8" shank edge finder with 0.100" radius tip, to zero the DROs. 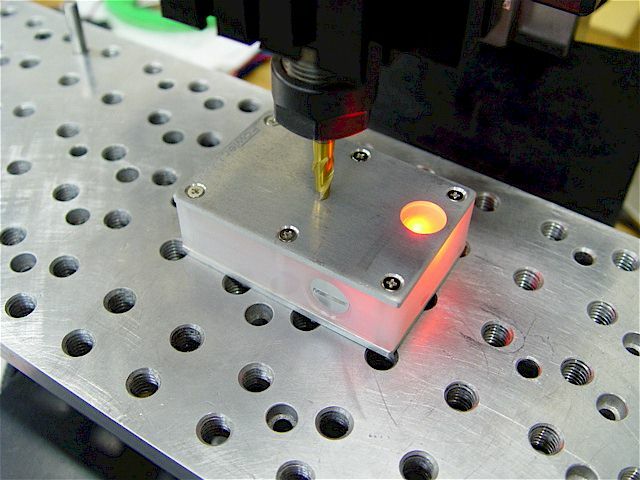 A single-slot fixture is on the right edge. 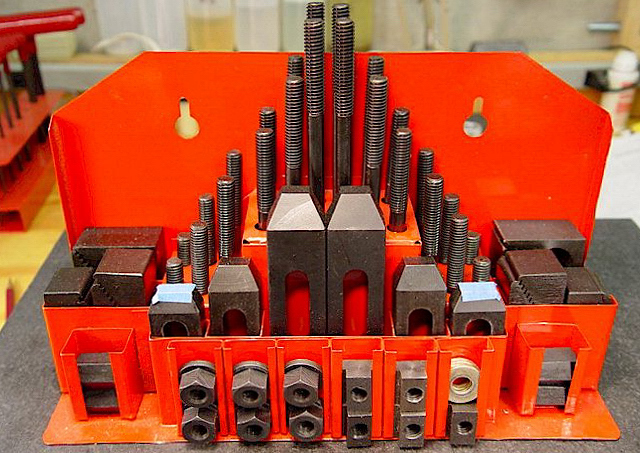 A toe-clamp set that uses 3/8-16 threaded studs.